Elopement at the Shangri-La in Paris. Jamie and Scott eloped to Paris. They decided to spend the week-end at the hotel Shangri-La with its beautiful view of the tour Eiffel. They thought of celebrating their union in intimacy with their very good friends before the big bash in the Hamptons! 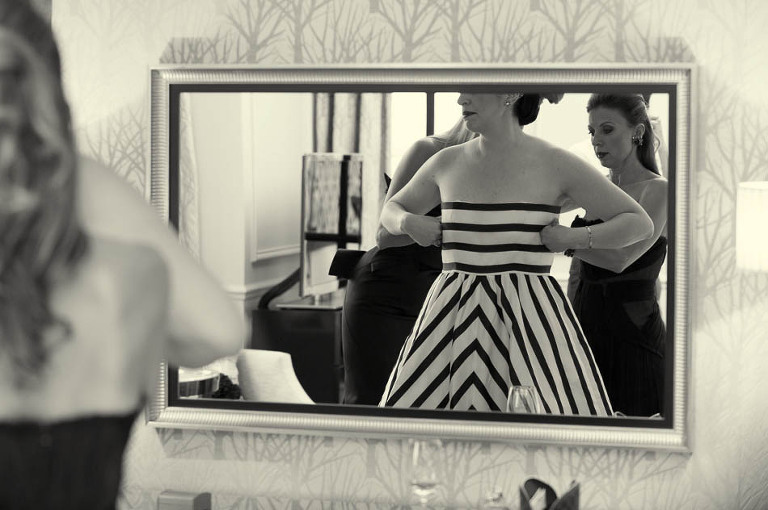 The “getting ready” took place at the hotel. Miyoko Yasumoto created all of the floral arrangements and the bridal bouquet, while my “All Star” hair and make up artists pampered the bride and everyone else! It started raining while i arrived at the Shangri-La. It actually went from a gentle drizzle to pouring rain. We waited and waited for the rain to stop and it never did. 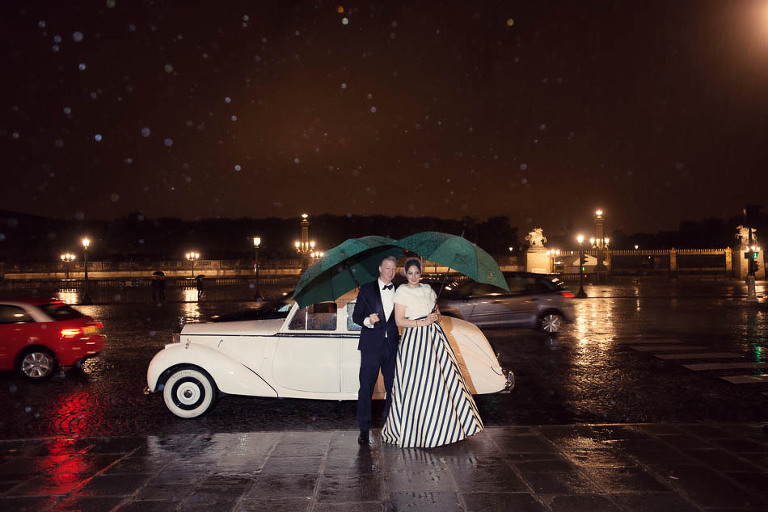 With the help of the staff from the Shangri-La, we organized umbrellas and as planned our chauffeurs took us to the Louvres for their elopement ceremony. Jamie was wearing a beautiful dress from Oscar de la Renta and the girls; couture NYC designers. Scott looked smashing in a classic tuxedo. 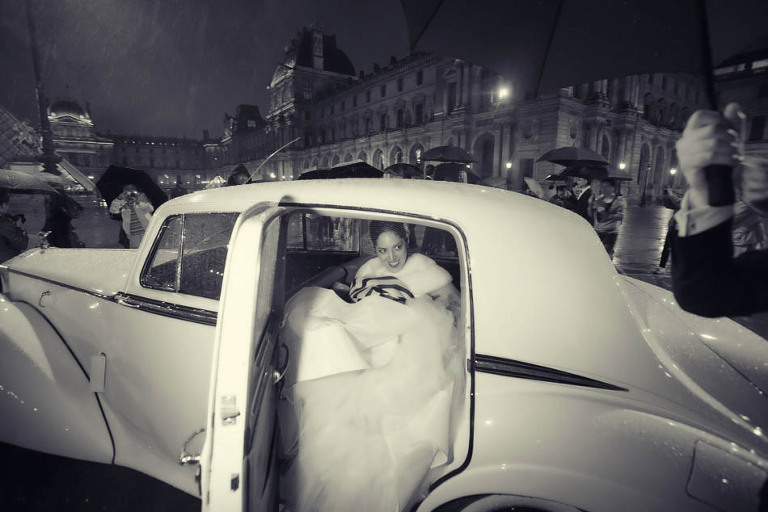 Regardless of the constant rain fall, their wedding ceremony at the Louvres, under the arcades, was all romantic. 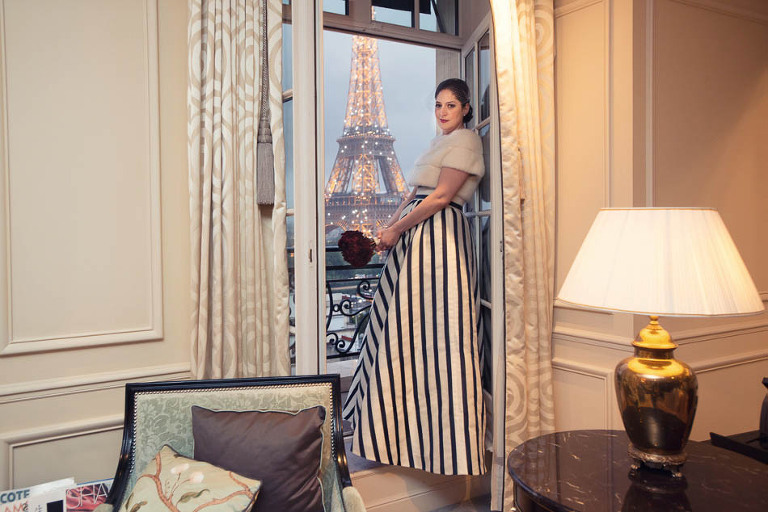 I am so glad i was able to assist them with the photography of their parisian elopement. Paris certainly is not Miami, it does rain in the city of light but it doesn’t stop the love of a couple for each other and the desire to seal one’s union in Paris! On our way to the Maison Blanche restaurant (one of the finest dining adventure in Paris, modern yet quite classy), we zoomed past the place de la Concorde. Paris actually is so beautiful at night when it rains. The square was all glittery with the reflection of the city lights on the wet pavement. I couldn’t help begging my clients for a last photo on the square, regardless of the rain! Oh Yes, those photographs did come up very nicely! I would like to thank again the staff of the Shangri-La who were all caring and attentive through out the day. It is always a real pleasure to photograph a wedding in this luxurious Parisian hotel. They have just received their 2 star michelin and very well deserve it. Our chauffeurs took every steps possible to make sure that no one was getting wet with very good humor. I love their wedding photographs. I have to say it wasn’t a bit easy playing outside with the rain! I did get wet, my cameras survived it all. A great wedding photographer should quickly adapt to any kind of situation, making the most of the surrounding. Looking back i am glad of the way the photographs came out. They are quite lively and show the loving atmosphere of the day. © 2019 Destination wedding photographer videographer Paris Normandy France|ProPhoto Photography Theme|Design by Northfolk & Co.